A whole-person wellness walk is a great way to incorporate personal wellness concepts and the multiple dimensions of wellness into one enjoyable activity. Sit tall against the back of a chair or stand tall with feet shoulder-width apart or wider. Gently bend the trunk to one side as the opposite arm reaches up above and then across the head to form an arc. Part I presents an overview of the physiological aspects of aging and the field of gerokinesiology to help readers understand the psychosocial and cognitive benefits derived from regular physical activity. Part II leads readers through the process of conducting preexercise health screenings and assessments, providing meaningful feedback to clients, evaluating program outcomes, and helping clients develop short- and long-term behavioral goals. Part III emphasizes programming principles and training methods that will facilitate the development of well-rounded and effective exercise programs. It includes specific activities for engaging older adults mentally, emotionally, socially, and spiritually along with myriad dynamic and static flexibility exercises to address joint and muscle flexibility, muscle strength, balance, mobility, endurance, and power. Part IV focuses on the teaching, motivation, communication, and leadership skills that are necessary for creating effective and safe programs for older adults, with or without specific medical conditions. Later Life Training Curricula: The Gold Standard for Instructor Training? 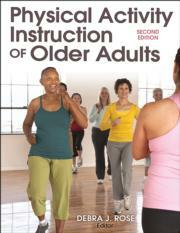 Text for certification providers and universities offering courses relating to physical activity and older adults; also a reference for physical activity instructors, fitness specialists, personal trainers, activity directors, activity assistants, and therapeutic recreation specialists working with older adults. Debra Rose, PhD, is a professor in the division of kinesiology and health science and director of the Center for Successful Aging at California State University at Fullerton. She also serves as codirector of the Fall Prevention Center of Excellence at the University of Southern California. Her primary research focus is on the enhancement of mobility, postural control, and the prevention of falls in later years. Rose is nationally and internationally recognized for her work in assessment and programming for fall risk reduction. Her research in fall risk reduction in the elderly has been published in numerous peer-reviewed publications, including the Journal of the American Geriatrics Society, Archives of Physical Medicine and Rehabilitation, Neurology Report, and the Journal of Aging and Physical Activity—where she also served as an editor in chief. She was an expert contributor to Global Report on Falls Prevention in Older Age, published by the World Health Organization in 2007. Rose is the creator of the innovative fall risk reduction program FallProof™, which was recognized by the Health Promotion Institute of the National Council on Aging (NCOA) in 2006 as a Best Practice program in health promotion. This program is currently being implemented in numerous community-based settings and retirement communities throughout the United States. Rose was also the recipient of the 2013 Herbert A. DeVries Award for Distinguished Research on Aging from the American Association for Physical Activity and Recreation. She is a fellow and past president of the National Academy of Kinesiology (formerly American Academy of Kinesiology and Physical Education) and former executive board member of the North American Society for the Psychology of Sport and Physical Activity. Image bank. Includes all of the images from the text—sorted by chapter—to provide instructors with flexibility when creating their own customized presentations, handouts, and other course resources.